Recently I was invited to join the founding Board for a new organization, The Colorado Authors’ Hall of Fame! Of course, I’m honored and excited, as are all the members. Authors are all about words, so I decided to weigh in on the question: why do words count? For me, the short answer is in three words: realizing; forming; sharing. The long answer goes something like this. Realization comes as we notice something making sense in a new way. It might come as a metaphor: that swooping butterfly is a Blue Angel jet streaking across the sky. Or it might come as a fresh perspective: I didn’t know I really love to cook. Whatever the realization is, it comes in words. Some people aren’t great with words, some are. If you’re not, there are writers whose words can make sense of whatever you’re trying to understand. If you are, you’ll get confirmation from fellow word-smiths that you’re onto something valuable. Formation of ideas happens as we wrestle with our concepts. This formation process occurs as we try to put our ideas into . . . you guessed it, words. Now that we have realizations and ideas that have taken form, we get to share them. I can tell you about my new project, or my recent conversation—which also took place through words. Some sharing we do in real time. But some of what we have to offer gets shared later. A memo can be read a week later. A letter can be read years letter. A book can be read centuries later. Louis L’Amour, my friend and mentor, may still be writing in heaven, and I sure hope he is. But meanwhile, he left behind collections of his words in his hundred-plus books. He left a legacy of insight and detail about the American West that we just couldn’t understand nearly as well without his work. Long afer we are gone, our words remain. The words we use stay in the memories of those who have heard us. And the words we write last forever encapsulating moments in time, creating gems in amber—like a Authors’ Hall of Fame. When Hummers Dream, my first novelette, came about as one-quarter remembrance and three-quarters imagination. The setting and the tone of this story is idyllic and even a bit magical. Based in part on a real experience I had, I remember so clearly the beauty of that day as my friends and I enjoyed lunch in a gorgeous garden with a spectacular ocean view. And then something bad happened . . . and it transformed into something transcendent, as you’ll see in this novelette. I knew I would write about this one day, and would try to include the magical-mysterious-spiritual aspect of the experience. Sure enough, the little bird tapped on my window pane as my publishers were preparing novel #1 of my series for launch. “Aha,” I thought. “It’s time!” Believe it or not, while I wrote this novelette, a hummer repeatedly hovered in the frame of one particular window pane, my little winged editor making sure I got the story right. So yes, some of this story actually happened . . . but much of it takes place in the imagined life of my protagonist who helps her little bird by painting a dream-garden for him. Where reality ends and imagined-reality begins is hard to say. And one element that did NOT happen in real life was the arrival of “Lime Woman” — a bossy, intrusive pill of a woman who barged into my story, startling me as much as she startled my protagonist Miranda. She seemed to arrive of her own accord and I had no choice but to let her walk all over my beautiful, peaceful story! But my author-self knew enough to trust that she actually belonged, even if I’d have loved to kick her out. Comic relief . . . dramatic tension . . . extreme contrast . . . she serves all those purposes. She had me laughing, then my editor laughed out loud, and soon my readers decided she was a “contrarian favorite”. When Hummers Dream launched, and this novelette flew to the top of the best-seller lists. The story, published as a prequel to What the Heart Knows, set a trend for prequel short fiction, and was embraced by the huge communities of hummingbird lovers I’d never known about, who wrote to me from all over the country. How wonderful to discover so many of us treasure these precious, tiny but mighty birds who fly thousands of miles each year, bringing joy when they arrive. So even if “Mrs. Lime” doesn’t love hummers—nor much of anything else—see if she brings you a laugh as you enjoy your visit to the magical garden in Milford-Haven. 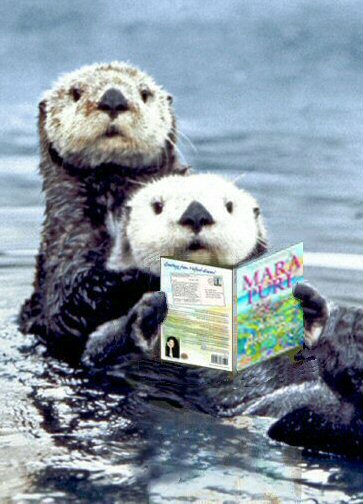 Visit MaraPurl.com to subscribe to Mara’s newsletter and find out more about her books. 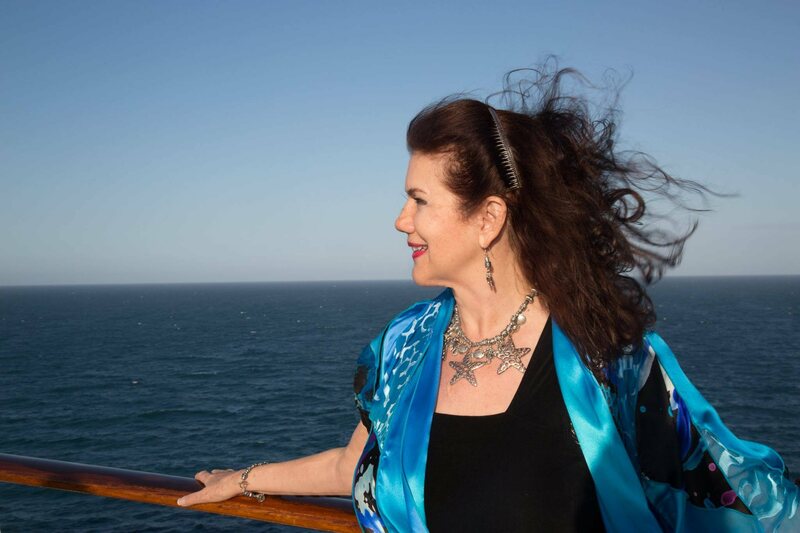 Publishing at Sea: I was recently a faculty member at this marvelous conference for authors. Those of us who have published works—whether faculty or conference attendees—were invited to sign our books at two separate signing events on the third-largest cruise ship in the world. What an opportunity! What an honor! And what fun to connect with so many new readers! Royal Caribbean’s Oasis of the Sea is, indeed, the third-largest cruise ship on the oceans: 1,186 feet in length, rising 236 feet above the waterline, and weighing 225,282 tons, an engineering marvel apparently effortlessly afloat. On the sixteenth deck—that’s right, the sixteenth—you can sit in sheltered splendor inside a solarium, gazing out at nothing but ocean. On the eighth deck, you can sip tea or wine in one of the enclaves edging Central Park—a massive deck replete with trees. On the third deck you can sit in comfortable classrooms and conference rooms attending meetings or sessions. And on the Main Promenade, the ship’s Cruise Manager worked with our Publishing at Sea Founder Judith Briles to arrange for us to array our books on tables and greet the 6,000 passengers who strolled by. Imagine being featured inside an elegant, well-appointed mall, with passengers hearing announcements about authors signing their books. They add us to their schedules, or happen by as they consider where to shop after lunch. Our events were something like that, though better, since we had a captive audience. What we found was that people were curious, inquisitive, and eager to find just the right book for themselves, or to have gifts to offer when they returned home from their cruise. All the authors in Publishing at Sea follow a practice not only of courtesy toward one another, but we also have an awareness of the value of synergy. If I talk about my colleague’s book, he may make a sale. If I hear a reader mentioning a topic of interest, I might know where to direct him or her. Readers notice this behavior, and appreciate it. Who would want to buy a book from a self-absorbed author who doesn’t care about others? I’ve done book signings in so many bookstores and in so many locations over the years, some well-planned and well-attended . . . some not. Since I love bookstores, I never think of these events as wasted time. 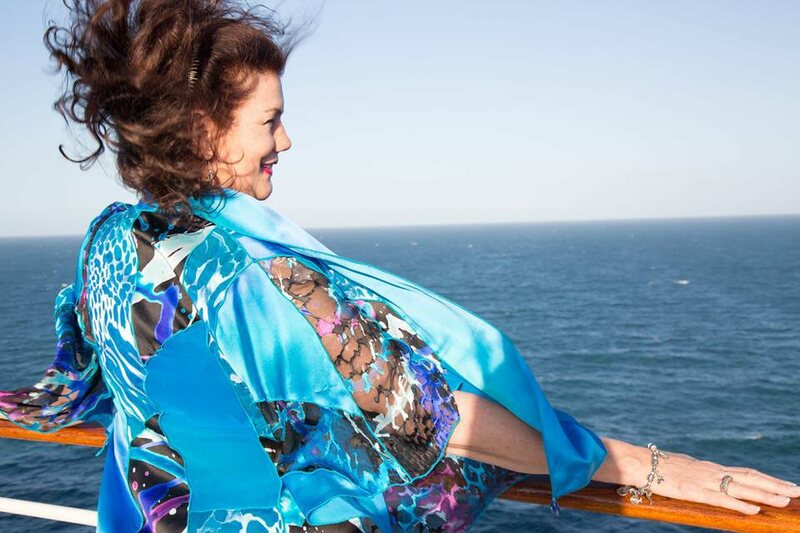 But being part of a truly fabulous, inclusive author signing on an elegant cruise ship somehow beats sitting alone at the back of an empty store. If you’re thinking of joining us for Publishing at Sea next year, here’s one more reason to say yes. Well-planned signings are wonder challenges for the head. Standing shoulder-to-shoulder with fellow authors and reaching across tables to connect with readers . . . well, that’s a fulfillment of the heart. 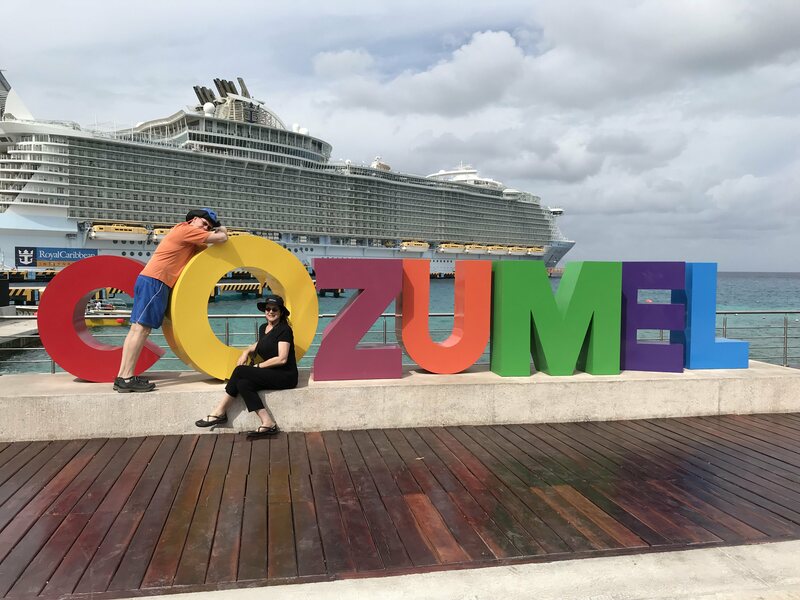 Our third visit was to Cozumel, once a colony of Spain, now part of Mexico, off the eastern shore of its Yucatan Peninsula. Once we glimpsed its azure waters, it was easy to understand why it’s one of the world’s most famous destination for snorkeling and scuba diving. We’d hoped to snorkel, having managed to fit our gear into our luggage. But when we discovered we wouldn’t have time for that lengthy of an excursion, we decided to stay in port where we found all kinds of treasures. Shortly before our cruise began, we’d started listening to the audio book of James Michener’s Caribbean—a fascinating book which, true to form, begins with the pre-history of the region. I know his books are carefully researched—I actually worked for him as one of several researchers while I was a college student. But I did some of my own research about Cozumel, too, discovering that the Maya are believed to have settled the island by the early part of the 1st millennium AD. According to their religion, the island was dedicated to the Moon Goddess, but eventually had to battle the warring Caribs who destroyed temples and practiced human sacrifice on the original inhabitants. The island does have Mayan ruins, which we wish we’d had time to visit. The Maya were still there when the Spanish arrived in 1518, greeting the visitors more peaceably than people on the mainland, and resupplying their ships even after Cortes destroyed some Mayan idols and replaced them with statues of the Virgin Mary. Sadly, most of the Maya were killed by small pox, brought to the island by a later Spanish expedition. Those left on the island were later evacuated to the mainland to avoid frequent raids by pirates. A compelling landscape of jungle, soft, white sand beaches, and the spectacular waters, now surrounded by the Cozumel Reefs National Marine Park, beckon to visitors. But we found the charming portside shops equally compelling in a different way, offering the gorgeous craftsmanship of silversmiths, as well as jewelry of all kinds from tribal to polished and refined—all of it offered by expert bargainers who love nothing more than a good negotiation over price. Since I write about a small, coastal town that draws tourists both with its picturesque beauty, and it’s local arts and crafts, I always find it fascinating to find parallels in other locations. So Cozumel deserves a closer look. At least we scratched the surface of that beautiful island off the Yucatan, and we look forward to returning to those sparkling waters for further adventures. The second port-of-call on our voyage was to Jamaica, once a British colony, that still has elements of the cool, collected English culture woven into the bright, vibrant fabric blended of indigenous and African peoples. One still drives on the left; one may still take tea in the afternoon; language has a touch of formality; bearing is upright; and the island is enticing in its beauty and grace, while at the same time being a complexity of profits and losses, of abundance and of want. The original inhabitants of Jamaica, like those of Hispaniola (now Haiti and the Dominican Republic) are believed to be the Arawaks, also called Tainos. Migrating northward from South America 2,500 years ago, they named the island Xaymaca, meaning “land of wood and water.” Peaceful by nature, they were adept at agriculture, developing bounty by growing cassava, sweet potatoes, maize, various other fruits and vegetables, plus cotton and tobacco. There follows as colorful a history as can be imagined—and has been, in numerous books and films. Christopher Columbus arrived in 1494. In 1509 a new group of Spaniards arrived to establish a colony. In 1655, the English attacked Jamaica and the Spanish surrendered. By 1673 the English had installed the pirate/ privateer Henry Morgan as its Lieutenant Governor. And by 1739, 430 thriving sugar plantations had been established—built upon a labor force of enslaved Africans. Frequent slave rebellions gradually eroded the false stability of the island, with their full freedom granted in 1836. Jamaica’s history remained tumultuous following the freeing of the slaves, but there was always a drive toward autonomy and in 1962 Jamaica gained political independence from England and its Constitution took effect. Our ship pulled into Falmouth, alongside a Disney cruise ship, which looked enormous, until we looked back toward the harbor from land, and saw it wasn’t as large as our own. I imagined, for a moment, how many ships had docked here over the centuries. For passengers aboard our cruise, marvelous excursions were available to take advantage of sugary beaches and water sports, which many people enjoyed. My husband and I, and a few other friends, however, chose to spend our day differently. The ship offered a “Pay It Forward” option that would allow us to spend a day first at a homeless shelter in the country, then at a soup kitchen in the inner city. This was exactly our “cup o’ tea” and we boarded a mini-bus that drove us past the vast estates with their lush vegetation and ocean views that used to be the plantations. These eventually gave way to hotel-row—huge, walled properties offering protected beaches and all manner of amenities. At last we arrived at the outskirts of Montego Bay, where we spent the morning. We were greeted by Junice Norman, a force of nature. Articulate and passionate, she welcomed us and explained the services offered their homeless guests while enlisting our aid in harvesting eggs from their chicken coop, and planting new rows in their gardens, where my husband mastered the technique of planting with a machete. Neither guests nor staff are indolent, and all the tasks at this shelter are designed to train, or re-train, temporary residents, giving them practical skills with which to re-enter society. As a writer, I thought about what words I might use to describe these surroundings: modest, basic, limited. Yet with the conviction that infused the musical intonations of our host, so much more became discernible: generosity, industry, progress, hope. There’s a special place in heaven—and Earth—for those who dedicate themselves to managing this special place, and places like it. What minuscule assistance we were able to offer during our excursion day seems paltry in the face of hardships born by so many. Those who run the shelters and services use their heads to manage budgets, ask for funding, repurpose every element they can, and work miracles. But what they really do is see beyond present circumstances into the new possibilities they can create with and for those in their care, an endeavor which is all heart. 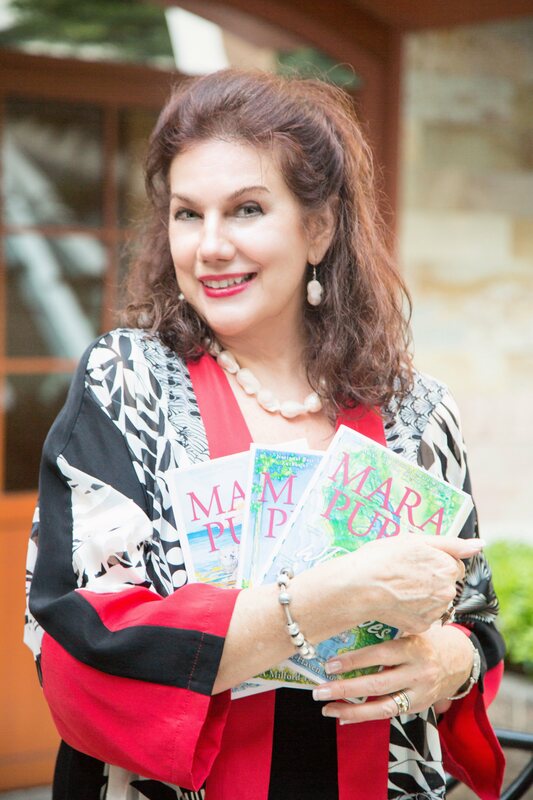 Discover more about Mara, her books and events, at MaraPurl.com. Mara’s cruising photo by Ashlee Bratton. Join us on a future cruise at Publishing At Sea. Thanks for joining me on the Mother’s-Day-to-Father’s-Day Thunderclap Campaign, “You Otter Follow Your Heart” which runs for just 4 more days! To thank you for joining, you’ll receive a FREE Advance Copy of my brand new story When Otters Play. In honor of Father’s Day this month, this post shares moments about my late father. “Husband your resources,” my dad said. I was standing on a commercial pier in San Pedro speaking on the one and only pay phone. “And have a large time!” How concerned he sounded, and how determined to support this crazy trip of mine that would start within the hour. I was about to embark on a Greenpeace Voyage to save whales as one of twenty-six crew members. We’d be traveling 6,000 miles in the North Pacific with more bravado than experience, our hearts aflame to do right by the cetaceans that were still being slaughtered by huge fleets of commercial whalers from Russia. I loved my dad’s advice. I did work carefully with the rest of the crew to “husband” the resources—like fresh water—that would have to last six weeks. And I did have a “large” time on that world-class adventure. I got home safely—we all did. But looking back, I can hardly imagine being as supportive, brave and level-headed about a child of mine going so far beyond the boundaries of communication and safety. Then again, as a member of the Greatest Generation, my father had made it through the Great Depression in childhood, life-interrupted by WWII, served as a member of General MacArthur’s staff in Japan following the war, navigated his way through a stunning international business career, and still managed to direct or star in 200 plays as a graduate of Yale Drama School. But I wonder whether any of these world-stage challenges were as demanding as the one that occurred on his own personal stage: fatherhood. Dad’s roots were in the theatre. His father, Billy Purl, was a well-known Vaudevillian; his mother, Beatrice Seville, an established actress and founding member of Actor’s Equity who spent years on the road. Traveling by train, she tread the boards in city after city, her young son sleeping in the upper tray of her travel trunk, imparting to my dad a life-long love of trains, and of theatre. He married my mother when she was not yet of legal age, with the blessings of her family. They had a number of years as a couple, and by the time he and my mother returned from Japan, they each had pages of regional theatrical credits themselves, and were ready to get serious about their careers. Mom, a talent and a beauty, landed a major film role. Dad, move-star-handsome, was about to take the industry by storm, drama-degree in hand. In their head shots—now framed and adorning my family-photo wall—they resembled Vivien Leigh and Tyrone Power. On the way to stardom, something happened: children. From what I can tell, they leapt into this next chapter of life with feverish joy, upending all their plans in favor of creating the thing my dad later treasured above all things: The Four Purls. That’s how he referred to us, his eyes beginning to pool, whenever we found ourselves together. Often, our gatherings were backstage when one of us was performing, as my sister and I followed in the family footsteps. Sometimes our gatherings involved dinner and dancing. Of course, he never got to sit down. The father of two daughters always had one of three dance partners clamoring for her turn. But before we could enjoy those wonderful moments of mutual support and celebration, there were the childhood years for the two little girls who interrupted our parents’ lives, yet again. Pere—that’s what I called him—taught me how to ride my bike, a hilarious series of near-disasters as I wobbled my way down the lane, Pere running alongside alternating between grabbing for my handlebar to keep me from falling away, and leaping out of the way to prevent my crashing into him. The overview I recall is thanks to this being preserved on Super-8 film, as were many of our childhood chapters. What I actually remember about those first bicycle forays was that my father was there for me, cheering me on, keeping me safe while at the same time gently pushing me forward into my independence. A few years later, my sister and I would spend our first hour after school exploring our Tokyo neighborhood on our bikes. And still later, I would tackle fifty-mile bike trails in California and Colorado. So the bike-skill became a physical practicality. But as a metaphor, it became so much more. The key to riding a bike is, of course, balance. And at this, my father excelled. He balanced career and family; he balanced his business career with his passion for theatre, perhaps performing as much as he would have, had he stayed a theatre pro. He balanced his own political and societal philosophies with those of his community, never losing a friendship in ninety-nine years of a full life. He balanced his personal goals with those of his wife in a marriage lasting over seventy years. And he balanced who he was as a man-of-the-world with who he was in his favorite role of all: Pere. We tested him, as all children test their fathers. There were times we had to agree to disagree. We had a parting of the ways politically, yet we always maintained our mutual respect, as our views were each thoughtfully considered. When I left my journalism career to return to acting and writing dramas and novels, he thought I was making a serious mistake and was in danger of ruining my life. We had a couple of years when I felt bereft of his approval. Yet pushing away from him strengthened me, and as my work began to click, I earned his respect at a new level. We admired one another’s acting work: he directed me in a favorite play, and he performed in my BBC radio drama, both stellar experiences. And then, one day he said, “You know, your writing is damn fine.” Not even the thirty book awards I’ve since earned could ever mean as much as those simple words. “The longer you live, the better my life will be,” I said to him one day. He took me at my word and made it through to 100, minus a few days. His last year was surely his most difficult. It’d never occurred to him that his wife’s would precede his own passing, so it was the one thing he’d never planned for. He made a valiant effort to hold on, but began to lose his moorings. We cared for him at home, taking turns through an exhausting schedule, but we wouldn’t have had it any other way. To fulfill some speaking commitments, I had to be out of town for a couple of weeks. Cancelled flights led to a slight change of plans that meant I’d be home for a few hours. His house was only a few minutes from mine, but I’d risk being late to the airport if I stopped to see him. Still, I wanted to. Would I scare him by showing up unexpectedly? Disappoint him when I had to leave again just minutes later? Risking all that, I let myself in through the back door and found him slowly making his way across the kitchen. “Hi, Pere!” I said. He turned around, beaming. He was surprised, was in fact tracking my schedule with perfect clarity. And he was delighted, even when I said we had only twenty minutes. I made us coffee and we sat in the kitchen, sharing our news. Of all the hundreds of precious moments together, this became one of our favorites. He was always a tower of strength to his girls. We looked up to him, counted on him, expected—no, demanded—he be everything a father could possibly be. And he lived up to all that. During his final years, he became vulnerable in a way he never could have earlier in life. It was one of his final gifts to us—revealing his fears, accepting our help. He let us see that love really is reciprocal. I skinned my knee badly when I was five, and he carried me, screaming, to the sink where he washed and bandaged the wound, soothed my pain, made me feel brave. I helped him walk when he was ninety-nine, reassured him his journey made sense, made a difference, and had value greater than the gold of kings. When it came to the real paternity test, he passed with flying colors.